199 Jalan Bukit Bintang, Kuala Lumpur. PARTAKING in the Ramadan Santapan Buffet (Ramadan buffet dining) at The Westin Kuala Lumpur is like going on a gastronomic adventure. The entire floor of The Living Room, where the buffet is served, is filled with food stations offering a wide variety of local and international culinary dishes, starting from the “appetiser island” right up to the desserts in the hotel’s Daily Treats section. Kitchens assistant director Rudy Junaidie highlighted that the Cahaya Malam (Carving Lights) and Belgian Waffle were two stations newly introduced in this year’s buffet. “The Carving Lights station offers a taste of world culture with various regional specialities,” he said. Complete set: Old School Beef Short Ribs and Buttered Greens. 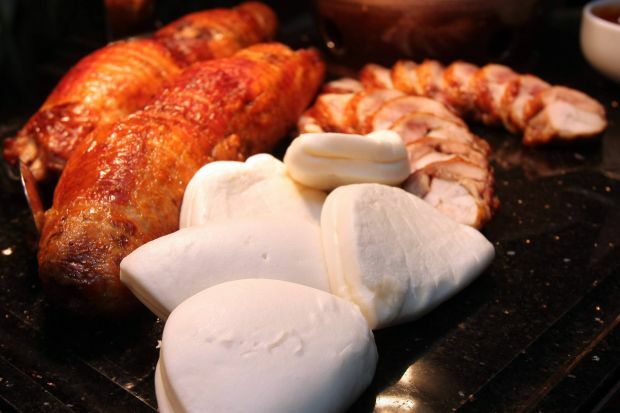 For example, there is the Roast Mongolian Wild Chicken Roulade, Steamed Man Tau and Mongolian Sauce, Old School Beef Short Ribs and Buttered Greens, Aromatic Lamb Leg with Boulangère Potatoes, and Oolong Tea Smoked Duck, Duck Sauce, and Mo Mo Skin. “The Belgian Waffle is a new addition to offer diners more options and can’t be found anywhere in Kuala Lumpur,” said Rudy. It features savoury toppings like Creamed Mushrooms, Potato Curry with Raita, Chicken Rendang with Pickles, and Roast Tomato and Cottage Cheese. Food and Beverage assistant director Huza Radzi said guests at each table would be served with Air Zam Zam along with ulam and sambal to break fast. “Air Zam Zam is holy mineral water imported from Makkah, Saudi Arabia. It is one of our hotel’s trademarks as we are serving this for the third consecutive year. “For Muslims, drinking Air Zam Zam during the breaking of fast makes it more meaningful,” he said. The “appetiser island” offers a mix of local and international appetisers like Nasi Ulam Seratus, Kerabu Udang Mangga Muda, Salad So Hoon Nyonya, Lautan Ais Batu (Seafood on Ice) and Fresh Mesclun Garden. For some tummy-warmers, head over to the “Sup Me Letup-Letup” station for a bowl of Braised Fresh Seaweed and Fish Lip Broth, Indian Vegetable Rassam or Sup Tulang Rawan Merah. The hotel’s Ramadan specialities are its Nasi Briyani Westin, Bubur Lambuk and Steamed Otak-Otak. “I would recommend that the Nasi Briyani Westin, which is my personal favourite, be accompanied with Gulai Kepala Ikan Salmon,” said Rudy. Hot off the wok are Kawah (cauldron) dishes such as Gulai Tetel, Gulai Nenas Ikan Masin, Rendang Paru, and Sambal Goreng Kg Jawa. Those who enjoy international cuisine will be spoilt for choice with Chinese dishes like “Xiangsi” Fried Beef with Green Chive and Sweet Daikon, Crispy “Mui Heong” Salt Fish with Spring Kai Lan and Wok Fried Tiger Prawns, and Bird’s Eye Chilli with Fermented Beans, Indian specialities like Sindi Pakora, Salmon Fillet Pepper Masala, Lamb Chop Tawa Mirch, Naan and Tandoori, as well as Mexican influences in the form of assorted tacos. 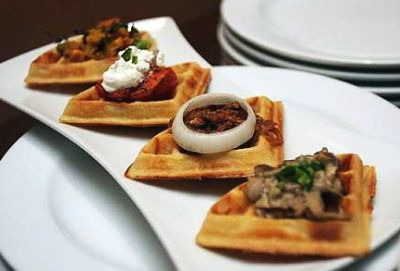 Served tapas-style: The Belgian Waffles come with savoury toppings like (from right) Creamed Mushrooms, Sardine Sambal and Spanish Onion Rings, Roast Tomato and Cottage Cheese, and Potato Curry with Raita. The Forbidden Treats station is for those who want to indulge into the sweeter side of life with Chocolate Fountain, Marshmallows and Cookies, Oreo Cheesecake, White Chocolate and Strawberry Cream Puff, Mango Pavlova and Chocolate Ganache Gold Slice. There is also a colourful selection of local fruits, including the king of fruits — the durian. 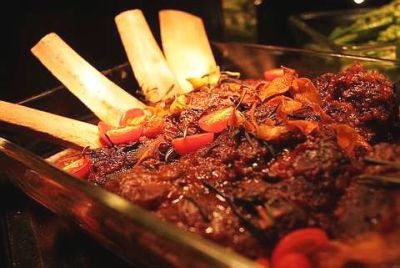 Muslim diners can feel at ease as seven of the kitchens within Westin Kuala Lumpur have been certified halal by the Department of Islamic Development Malaysia (Jakim). “The significance of getting our kitchens certified shows our commitment and sensitivity towards the concerns of our Muslim guests,” said Huza. The Ramadan Santapan Buffet is available till Aug 26, and served from 7pm-10.30pm daily. It is priced at RM108++ per person for Mondays to Thursdays, and RM128++ per person for Fridays to Sundays.